Walking with a rollator can be so intensive in the beginning that you forget to look around you. Which means you are not paying attention to where you are walking. This is the second in a series of six lessons on how to correctly use a rollator indoors. Our experts advice to keep looking ahead so that you can see on time whether there is an obstacle in your way. And keep in mind it is just a matter of getting used to walking with a mobility aid. With a lot of practice, everything will eventualy come together. 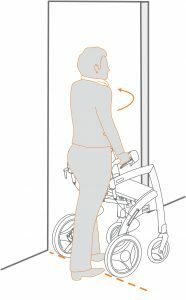 Walk as close as possible to the rollator, between the handles or close to the push handle (depending on the type of your rollator). This will give you the most support. Keep your arms and hands relaxed, to prevent overload. It is also safer and more pleasant to walk this way. Keep an eye to the surrounding environment to be aware of the movement around you. Look straight ahead as it is better for your balance, and also helps you to stand and walk upright. For walking upright you simply need to lift your chin, and your body will naturally stretch upwards. It is a built-in reflex. Lift your feet and do not shuffle. In the video below you can see how to walk close to your rollator. If possible, hold the fingers loosely around the hand brakes. In case of losing your balance or a misstep, you will automatically make a grabbing movement. While having the fingers around the handbrake you can brake and have some support. 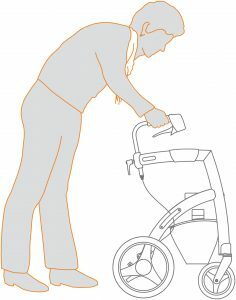 Walk upright, close to the rollator, and with the fingers around the hand brakes, like shown in the picture. Look ahead, so you can anticipate where you are going. Is there enough room for you and your rollator? If you are going around a corner, stay close to your rollator. Do not let the rollator make the turn first with you following behind it. You have to make turns wider than you may be used to. It is similar to driving a longer car. 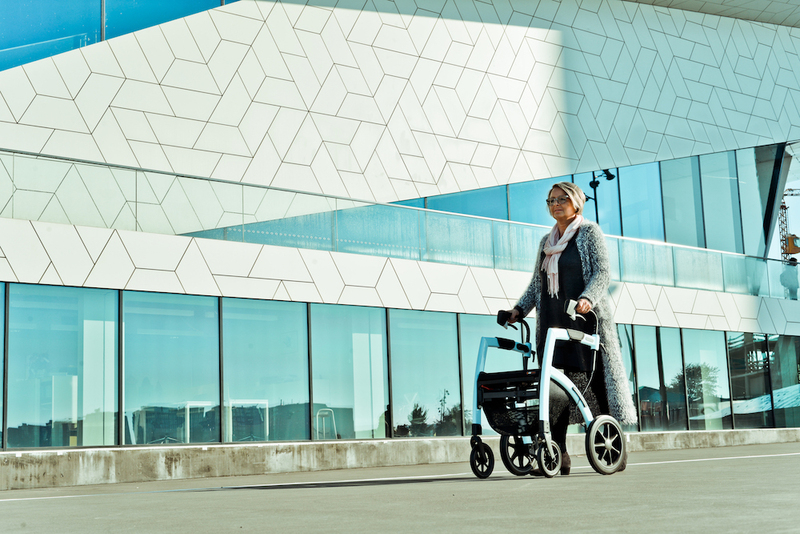 Your rollator needs just a little more space than you do. DO NOT walk like shown in the picture below! Do not look down as you walk. Do not shuffle your feet as you will fall more easily. Do not lean too much on the rollator, or you will walk too far away from it. Next lesson: Standing up from a chair and walk.